Featured within the article are several interesting, uncomfortable, and often-overlooked facts about Putin, Trump and Democrats. Given that these points are made here by a liberal media organ that is vehemently anti-Trump, within an article dispensing what has become the conventional Democratic wisdom on Russia, it is well worth highlighting them. 1. Obama and Clinton have radically different views on Russia. A major irony in the Democrats’ current obsession with depicting Putin as the world’s Grave Threat – and equating efforts to forge better relations with Moscow as some type of treason – is that it was Barack Obama who spent eight years accommodating the Russian leader and scorning the idea that Russia should be confronted and challenged. Indeed, Obama – after Russia annexed Crimea – rejected bipartisan demands to arm anti-Russian factions in Ukraine, and actively sought a partnership with Putin to bomb Syria. 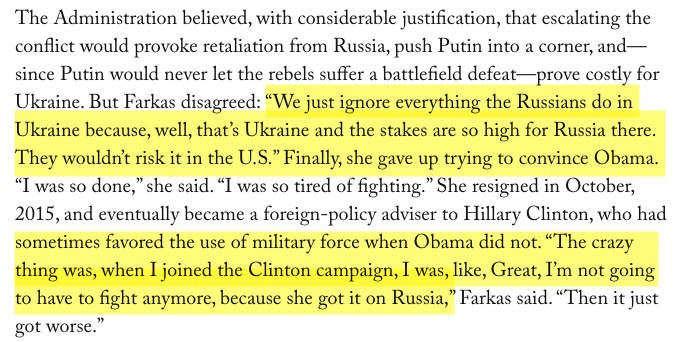 There’s a reason that those who were so eager for U.S. military intervention in both Syria and Ukraine were so passionately supportive of Clinton. 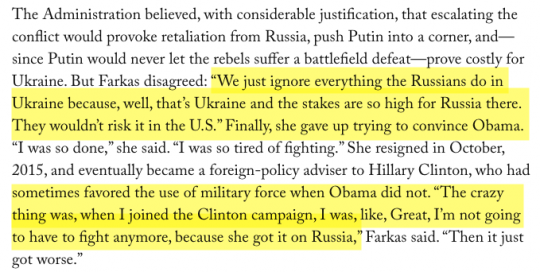 They knew there was a high likelihood that she would do what Obama refused to do: risk war with Russia in pursuit of these foreign policy goals. One can, of course, side with the Clinton wing on the ground that the U.S. has been too soft on Russia, but what should not be suppressed – and what the New Yorker article makes clear – is that the hawkish views on Russia now dominant (even obligatory) in the Democratic Party were exactly what Obama resisted up until the last day that he left office. That’s why people like John McCain, Lindsey Graham and Marco Rubio, along with various neocon organs, relentlessly attacked Obama on the ground that he was too accommodating of Putin in Syria, Ukraine and beyond. The post-election Democratic Party orthodoxy on Russia has deliberately obscured the fact that the leading accommodationist of Putin was named Barack Obama, and in that, he had a radically different approach than Clinton advocated. 2. 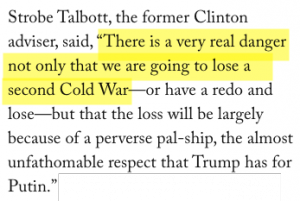 The risk of a new Cold War is very real and very dangerous. Today, the odds of a nuclear war being started by mistake are low—and yet the risk is growing, as the United States and Russia drift toward a new cold war. . . . The harsh rhetoric on both sides increases the danger of miscalculations and mistakes, as do other factors. Close encounters between the military aircraft of the United States and Russia have become routine, creating the potential for an unintended conflict. 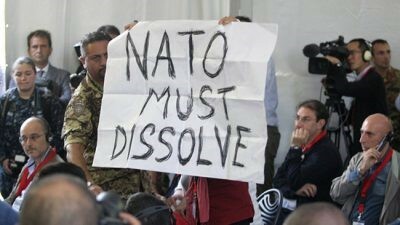 But regardless of where one wants to pin blame for these heightened tensions, the risks of heightening them further are incredibly high – one could plausibly say: incomparably high. Yet in the name of being “tough” on Putin, those risks are virtually never discussed, and anyone who attempts to raise them in the context of advocating better relations will almost instantly be accused of being a Kremlin stooge, or worse. 3. The U.S. media refuses to say if the U.S. interferes in Russia’s domestic politics. Is it true, as Putin claims, that the U.S., in fact, “has long funded media outlets and civil-society groups that meddle in Russian affairs”? Again, the article believes it’s significant enough to note that Putin claims this, but never bothers to tell its readers whether it is actually true, or even if evidence exists for it.What makes this steadfast silence so bizarre is that there’s virtually no question that it is true. Some have noted the 1996 Time Magazine cover boasting of how U.S. advisors helped the U.S.’s preferred candidate, Boris Yeltsin, win Russia’s presidency. 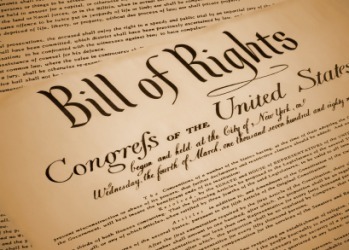 And, of course, the U.S. has continually and repeatedly interfered in the domestic political processes, including democratic elections, of more countries than one can count.But far more relevant, and more recent, are the very active efforts on the part of the U.S. Government to alter Russian civic society more to its liking. Many of these efforts, needless to say, are covert, but many are not. Here’s the National Endowment for Democracy – funded by the U.S. Congress through the State Department – openly touting the dozens of Russian political groups it funds. In response to all this, one can offer the same cliché that is invoked when it’s pointed out after a terrorist attack that the U.S. has killed countless innocent people all over the world: it doesn’t matter because two wrongs don’t make a right. That may well be true, but just as it’s difficult to actually fight terrorism if one refuses to grapple with its causes or if one objects only when one’s own side is the victim but not the perpetrator, it’s very difficult to credibly object to – let alone prevent – other countries from interfering in U.S. politics if you make no effort to object to U.S. interference in theirs. And at the very least, U.S. journalists who discuss Putin’s claims in this regard should not just summarize those claims but report on whether they are valid. The refusal to do so is as conspicuous as it is troubling. 4. The U.S. Government still has provided no evidence of its theories about Russian hacking. That Putin ordered Russian hacking of the DNC’s and John Podesta’s emails in order to help Trump win is now such consecrated orthodoxy that it’s barely acceptable in Decent Company to question it. But that obscures, by design, the rather important fact that the U.S. Government, while repeatedly issuing new reports making these claims, has still never offered any actual evidence for them. Even the New Yorker article, which clearly views the theory as valid, acknowledges this fact: Recall that even hardened Putin critics and western journalists in Moscow were aghast at how evidence-free these government reports have been. The lack of evidence for these theories does not, of course, prove their falsity. But, given the stakes, it’s certainly worth keeping in mind.And it further underscores the reasons why no conclusions should be reached absent a structured investigation with the evidence and findings made publicly available. Anonymous claims from agenda-driven, disinformation-dispensing intelligence community officials are about the least reliable way to form judgments about anything, let alone the nature of the threats posed by the governments they want Americans to view as their adversaries failure. 5. 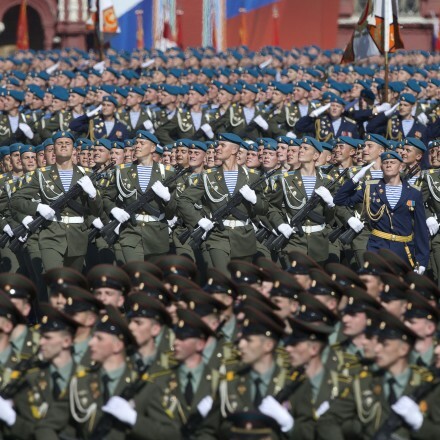 Fixating on Russia continues to be used to distract from systemic failures of U.S. elites. That Putin abuses the civic freedoms of Russians plainly answers none of the policy debates over Russia, given how ready and eager the U.S. is to align with the planet’s worst monsters. It’s instead designed to encourage Americans to fix their gaze on bad acts by people thousands of miles away in order to obfuscate the corruption of their own society and savagery by their own leaders. 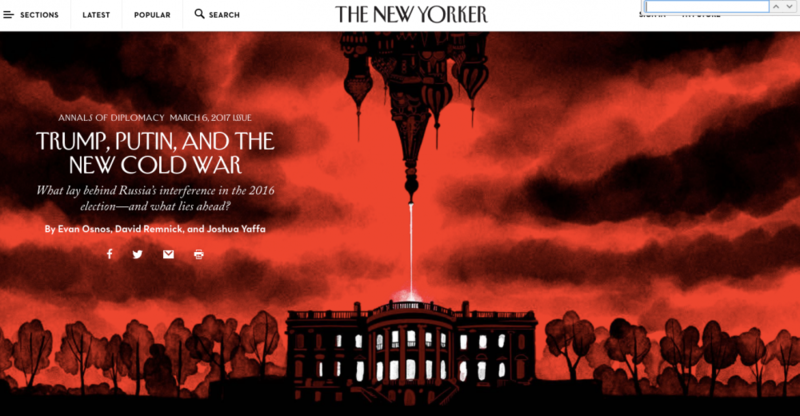 In several places, the New Yorker article warns against exploiting and inflating claims about Putin as a means of ignoring that the real causes of America’s problems reside not in Moscow but at home: It is true that Putin is used to avoid confronting the fact that Trump is “a phenomenon of America’s own making.” It’s also true that it’s used to avoid confronting the fact that Trump is a by-product of the extraordinary and systemic failure of the Democratic Party. As long as the Russia story enables pervasive avoidance of self-critique – one of the things humans least like to do – it will continue to resonate no matter its actual substance and value. And this avoidance of self-examination extends to the west generally: As Even The New Yorker Admits™, the primary reason for Trump, for Brexit, and for growing right-wing über-nationalism throughout Europe is that prevailing neoliberal policies have destroyed the economic security and future of hundreds of millions of people, rendering them highly susceptible to scapegoating and desperate, in a nothing-to-lose sort of way, for any type of radical change, no matter how risky or harmful that change might be. But all of that gets to be ignored, all of the self-reckoning is avoided, as long we get ourselves to believe that some omnipotent foreign power is behind it all.Using Russia – yet again – to whitewash our own sins and systemic failures is bad enough. Let’s just hope it doesn’t lead the two countries back into a protracted and devastating Cold War or, worse still, direct military confrontation. With tensions rising and rhetoric becoming harsher and more manipulative, both of those outcomes are more likely than they’ve been in many years. The proposed $54 billion increase is roughly the size of the entire annual military budget of the United Kingdom, the fifth-largest spending country.